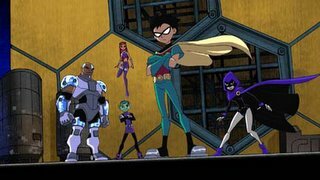 Cartoon Network Says No To Season Six of "Teen Titans"
If you feel there are more Titans stories to be told, let Cartoon Network know how you feel. Snail mail is the most effective way. Scores of individual letters have the most impact; Petitions are generally worthless in networks' eyes. The best bet is to start a letter writing campaign with individual heartfelt letters stating you would like the show to continue. MAKE SURE TO PUT "SAVE TEEN TITANS!" BIG AND BOLD ON THE OUTSIDE ENVELOPE! I found the name of the man responsible for Programming and Development of Cartoon Network: Senior Vice President Bob Higgins. We can start addressing letters to him. Spread the word and tell your friends. Titans Fans - Go! Cartoon Network Official Mailing Address: SAVE TEEN TITANS! [Big and Bold] Cartoon Network 1050 Techwood Drive Atlanta, GA 30318 Cartoon Network Feedback on the web. This week's episode, titled "Lightspeed" introduces Kid Flash into the DC Animated world.